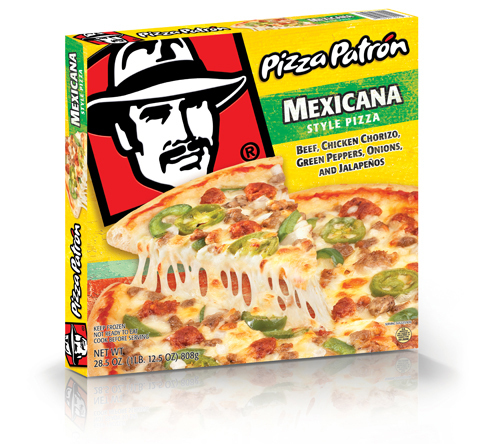 DALLAS – October 20, 2010 – Pizza Patrón, the nation’s number one Latin pizza brand, announced today that it is launching a new line of frozen pizzas as part of its multichannel growth strategy that now includes brand extensions through consumer packaged goods channels. This marks the first time in the company’s history that Pizza Patrón products will be available outside Pizza Patrón retail locations. Pizza Patrón frozen pizzas come in six popular varieties — Pepperoni, Cheese, Meat Trío, Mexicana, Patrona and Hawaiana – and will be in grocers’ frozen cases as early as October. Pizza Patrón frozen pizzas will be available in various grocery and convenience stores in Texas with plans to expand into other U.S. markets in 2011. Pizza Patron’s line of frozen pizzas introduces a new ‘classic crust’ style pizza from the chain, but still features the original Pizza Patrón flavor profiles that customers have loved for more than 24 years. The frozen pizzas are made with high-quality ingredients and the chain’s proprietary blend of spices and crushed Roma tomato sauce, giving consumers another convenient way to enjoy Pizza Patrón at home. This latest innovative product launch is part of Pizza Patron’s overall business strategy to grow the brand to a national presence within the next seven years, says Gamm. “The frozen pizza business has been around for many years, but we think this extension of our brand will attract Hispanics who are not currently frozen pizza eaters to try this food category. It’s also a great-tasting and affordable new option for general market frozen pizza aficionados,” said Guillermo Estrada, president of Pizza Patrón.